Algae can be removed by hand, by sliding the leaves of the plant between the thumb and index figure, by rolling filamentous algae around a stick, or, finally, with a scraper equipped with a razor blade or a small scouring pad (available commercially, although you can also make one yourself). Any rocks, sand, coral skeletons, branches, or roots infested by algae can be treated, outside the aquarium, in a 10% bleach solution, to which these algae are very sensitive. Any submerged equipment colonized by algae (heating, pipes, diffuser, filter) can be treated in the same way. It is important to rinse and dry them thoroughly before putting them back into the tank. Sometimes, however, the proliferation of algae can be so extensive that the only option is to create a whole new aquarium from scratch. It is unusual to find a proliferation of these algae in an aquarium. In an aquarium, these mainly consist of diatoms, unicellular microscopic algae. These grow and form a thin film on the decor and glass panes of the tank. Under poor ecological conditions, they can follow from certain green algae. green water; this is caused by the widespread growth of microscopic algae, generally unicellular, which can move around with the help of a flagellum. In a natural setting, these constitute phytoplankton. They often proliferate rapidly when the concentration of nutritional elements (mineral salts), particularly nitrogen, is too high, in strong light. Also microscopic, these are extremely ancient in origin: they were among the first living elements to appear on Earth. Despite their name, they form a green-blue, sometimes brownish, layer with a velvety sheen. They often develop if the lighting is excessive. 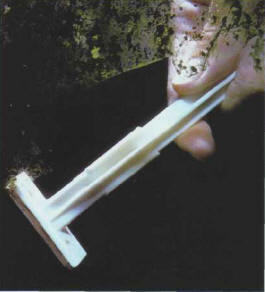 A disposable razor is useful for eliminating algae that grow on the aguarium panes. Try to regulate the factor provoking the algae overgrowth by adjusting the amount of light, which should be reduced in the case of green or blue algae. Changing the position of the tubes, or the addition of deflectors, to keep algae off the front of the tank, produces good results. In freshwater aquariums, you can make partial water changes, on a fairly regular basis, using water with a low hardness containing few mineral salts. Be careful, however, not to make any drastic alterations to the quality of the water if this has been specially adjusted to specific plants and fishes. In seawater tanks, change the water, replacing it with reconstituted water of the same salinity. These can involve the use of herbivorous animals only interested in certain types of algae, such as the fish mentioned above or gastropods (rare in sea water). The battle on the biological front is sometimes fought without any intervention on the part of the aquarist, as larger aquatic plants release substances that can inhibit the development of algae. The extent of this phenomenon is very difficult to appreciate in an aquarium, as it is invisible to the human eye. 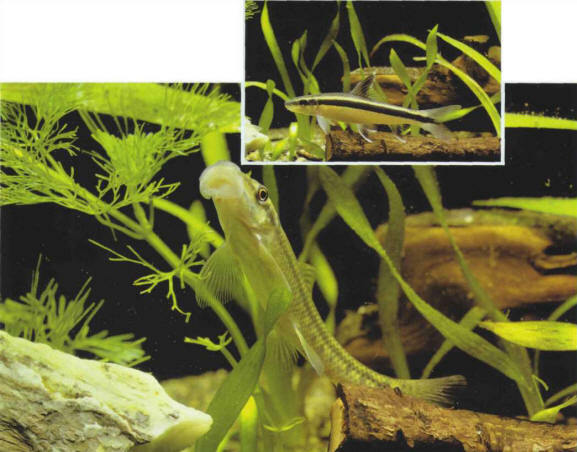 Several fish can be used in the biological battle against algae in fresh water: Epalzeorhynchus siamensis (right) and Gyrinocheilus aymonieri (left). There are special products on the market designed to kill algae. As their effect has not been fully established, it is best to be cautious with the dosage, as these substances probably also affect other plants. For the same reasons, the use of copper sulfate is not recommended, as it is dangerous for invertebrates. There is no miracle solution. The use of several techniques at the same time sometimes has positive results, but it is not unusual to find that the algae reappear after a while. It is best to get used to partially eliminating them on a regular basis.